« Innovations in academia: hype or trend? Imagine you accidently hit that stupid dining table with your foot again (Ouch!). As a result you suffer from an immense pain in your little toe for several days already. I bet you would go online to search for resolutions to cure this annoying pain. Aside of such trivial health problems, many people go online when they have to deal with serious health issues. In case of severe illnesses, such as a cancer diagnosis, patients not only search for relevant information but often also search for support from people who are in the same situation. The last three years I studied online support communities for breast cancer patients. In this blog I like to share the findings of one of my studies (conducted together with Enny Das), which is recently published in the Journal of Medical Internet Research. We know from scientific research that breast cancer patients are among the most active group of patients searching for social support online. For this purpose patients or ex-patients set up online communities to meet each other on the Internet. On these online message boards (also called discussion boards or online forums), patients share their personal illness stories, search for understanding from people who can relate to their situation, and look for recognition in the stories of others. These online platforms seem to be especially appealing because patients can talk anonymously with fellow patients, from anywhere, whenever they like. Yet, up to now, nobody knows for sure whether such online communities are actually helpful for patients. 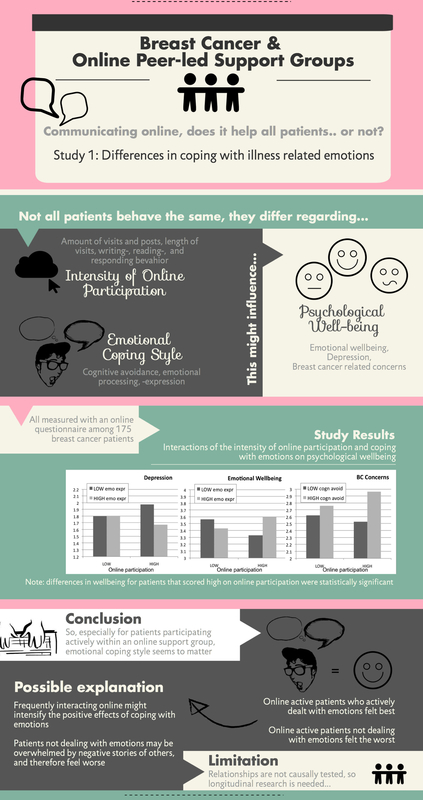 In other words, does online forum participation substantially contribute to patients’ psychological wellbeing? The last two decades, several researchers studied such online communities. Most of these studies are descriptive in nature. That is, researchers conducted interviews with participants or analysed their online conversations. These studies showed that patients generally appreciate the online support group and prove the presence of empowering processes and therapeutic aspects. Nevertheless, there are also some downsides. For example, patients mentioned that they sometimes have difficulties dealing with stories containing negative sides of the disease, and for that reason sometimes withdraw from the online community. There are only a few studies that empirically tested the effects of participating within an online support community on patients’ psychological wellbeing. Results of these studies, however, are mixed. Some studies showed positive effects, some showed no effects, and a few others even showed negative effects. So why do online support groups seem to be beneficial for patients in some cases and detrimental in other cases? In my PhD project we propose that these mixed findings might be caused by individual differences. This online “magic black box” appears as very helpful at first sight, but it might not work for everyone equally because patients differ among various aspects. Patients, for example, differ in how active they are within the online community, the stage of breast cancer they are in (from an early treatable stage to a very severe stage), the amount of support they receive from their family and friends, and how they deal with their illness psychologically. Results from my recently published study indeed showed that these individual differences were all related to patients’ psychological wellbeing. Moreover, these differences might have an influence on the effects of participating within an online support community as well. The current study showed that it was of importance how actively online participants dealt with their emotions. We already know from previous research on the psychological wellbeing of cancer patients that it is generally beneficial to actively deal with emotions rather than repressing them. Our findings showed that this was especially important for patients who are very active within an online support community. Online active patients who dealt actively with their emotions felt significantly better than patients who were equally active online but did not approach their emotions. We found no differences for patients who were much less active online. You can find a graph with the exact results in the following infographic. So what to conclude from these results? On these online platforms patients write and read about emotional cancer experiences. It might be that patients who know how to deal with emotions are more resilient to the negative stories they encounter online, and therefore are able to benefit from active online participation. For patients who are not dealing with their emotions, however, online active participation might backfire. They not only have to deal with their own difficulties, but are also confronted with stories from others that provoke additional distress they cannot cope with. However, future research must track patients over a longer period of time to prove effects. For example, it could be that patients who less actively deal with emotions can learn over time how to express their emotions from their online peers. To wrap this up, are breast cancer patients best advised to go online and actively take part in an online support community? Well, we still cannot answer this question with a simple ‘yes’ or ‘no’. Nevertheless, these results indicate that actively processing and expressing thoughts and emotions is of importance, especially when patients search for support online. Furthermore, researchers and health professionals should realize that one size might not fit all. Other external factors, such as patients’ personal situation and individual personality (for example how patients deal with emotions), might influence the effectiveness of such online support platforms. The scientific article covering this study is published in the Journal of Medical Internet Research and available online here.